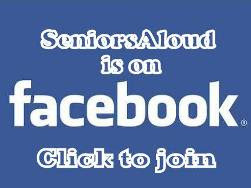 SeniorsAloud: ARE WE FILIAL SONS AND DAUGHTERS? ARE WE FILIAL SONS AND DAUGHTERS? 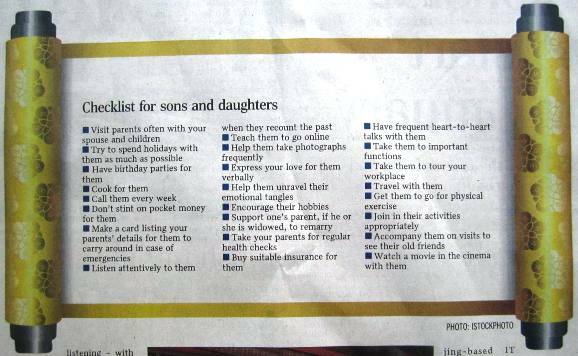 A checklist of 24 things to do for filial sons and daughters. What is your score? While the Confucian virtue of filial piety is not quite buried along with our ancestors from China, it is at risk of becoming as antiquated as foot-binding for young Chinese ladies from good families. The Straits Times today published an article that calls for a shoring up of filial piety in China. With the Chinese diaspora extending to all four corners of the world, the article may as well have been targeted at Chinese sons and daughters in Singapore and Malaysia. Are we baby boomers the last line of defence left to uphold and preserve filial piety? If our adult children and grandchildren seem lacking in respect for their elders, are we as much to blame as the changing times and hence, changing values? Have we pampered and mollycoddled them too much? 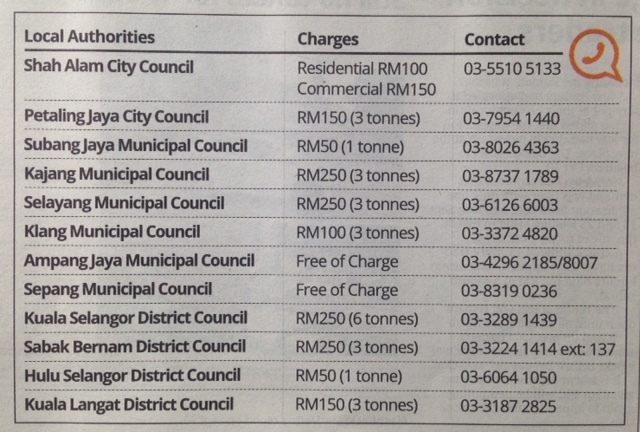 Have we allowed them to get away with indiscipline and disrespect to their parents and grandparents? 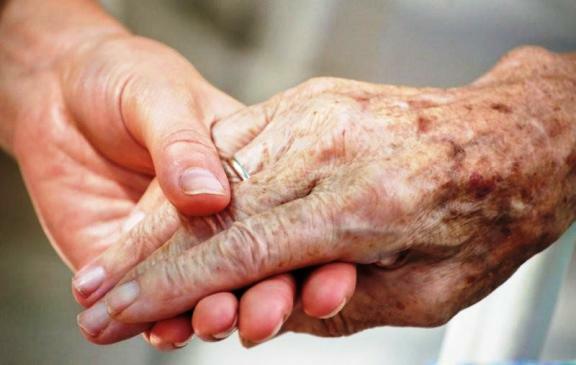 When was the last time we held our elderly parents' hands? What about us? Are we exemplary models for the younger generations to emulate? Can we look at ourselves in the mirror and honestly say that we have looked after our elderly parents well, and given them our love and respect? When was the last time we hugged our parents or held their hands? They don't need gifts of money, hampers of food or bouquets of flowers. All they want is the reassurance that they have not been forsaken and forgotten by their family members. I ask myself all these questions too, and I have gone through the checklist above. 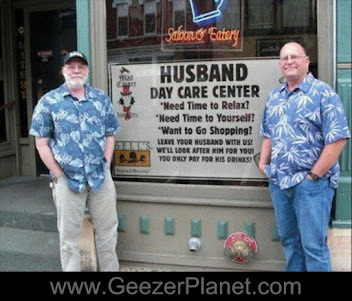 While my friends and family would consider me a good daughter, I must confess there is plenty of room for improvement. The time for us to start is right now, before the sands of time run out for our elderly parents, and it's too late for regrets. 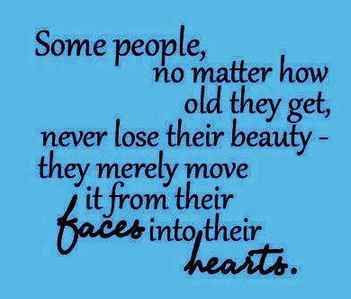 How we treat our elderly parents is how our children will treat us one day in our old age. They will learn from us. What examples are we giving them? I can't think of a more dedicated, caring, loving, sharing human being... than you! WOULD YOU PULL THE PLUG WHEN THE TIME COMES? IS RELIGIOUS FREEDOM THE RIGHT OF ALL CITIZENS?